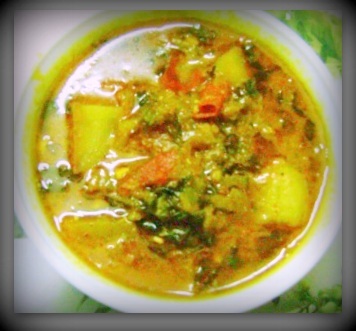 Methi (Fenugreek leaves) & Potato Curry | What's on my plate today!! This entry was posted in Indian Food Recipe, The Taste of India and tagged curry, dinner, fenugreek leaves, food, healthy, Indian Food, Indian recipe, Lunch, Methi, potatoes by whatsonmyplateblog. Bookmark the permalink. This looks fabulous! A friend was just telling me yesterday how fenugreek can be used to slow down the riping of fruits and vegetables, too….where can I get fenugreek and what form does it come in? Thanks for going through the recipe and thanks for letting me know one more usage…. Fenugreek is also known as Greek hay or bird’s foot and it is the small seeds from the Trigonella plant. You may buy these leaves from any Asian shop. Thanks so much for going through the recipe…Plz do share your experience!! I love the combo of methi and aloo! I make dry curry! But your recipe looks even more delicious! Loved it!